Claire Bury is currently Director of Services in Directorate General Internal Market and Services. She was previously Head of Unit for Company Law, Corporate Governance and Financial Crime in Directorate General Internal Market and Services, Deputy Head of Cabinet to Internal Market Commissioners Charlie McCreevy and Frits Bolkestein. An English barrister by training, she worked in the Commission's Legal Service and, before coming to Brussels, in the UK Foreign and Commonwealth Office. Jürgen Creutzmann MEP is Member and ALDE Coordinator in the Committee on the Internal Market and Consumer Protection. Between 1973 and 2006 Mr. Creutzmann worked at BASF SE, lastly as Director for Subsidiaries Accounting Services where he was responsible for the accountancy of around 50 subsidiaries and affiliated companies of BASF SE. Since 1983 he has b een Treasurer and Board Member of the FDP Rhineland-Palatinate. He has held many positions in German regional politics including serving as a member of the Rhineland-Palatinate District Council since 1989, the Palatinate District Council since 2004 and the Rhineland Palatinate Regional Assembly from 1998 to 2009 (since 2001 as Chairman of the Committee for European Affairs) . He was elected to the European Parliament in 2009. Christofer Fjellner is a Member of the European Parliament. He is Member of the Committee of International Trade, Member of the Delegation for relations with Belarus, Member of the Delegation to the Euronest Parliamentary Assembly, Substitute Member of the Committee on Budgetary Control, Substitute Member of the Committee on the Environment, Public Health and Food Safety, Substitute Member of the Delegation to the Cariforum – EU Parliamentary Committee and Substitute Member of the Delegation for relations with Iran. He is also Member of the executive board of Moderaterna (the Swedish conservatives) as well as Vice-president of Look Closer AB (a business intelligence company that he co-founded in 2000). From 2002 to 2004, Mr. Fjellner acted as President of the Nordisk Ungkonservativ Union (Nordic Young Conservatives) and Chairman of the Moderata Youth League. Mr. Fjellner studied political science and national finance at the University of Uppsala and the Lund University. Benjamin Jansen is deputy director Sanctions and Prevention Policy at the Dutch Ministry of Security and Justice. He is responsible for policy making in the areas victim support, games of chance, charities en prevention of crime. He formerly worked in different a policy area in the ministry and in a management consultancy firm. He holds a master degree in operations research and a PhD in mathematics and informatics. Henrik TJÄRNSTRÖM (Sweden, 1970), is CEO of Unibet Group plc and holds a degree in Industrial Engineering and Management from the Institute of Technology, Linköping University (Sweden). Before becoming CEO of Unibet in July 2010, Henrik was Group CFO (2008-2010) and member of the Board of Directors (2003-2008). Unibet was founded in 1997 by a Swedish teacher who channeled his passion for mathematics and sports into creating a better betting service at a better price to its customers. Since inception, the motto of Unibet has remained: ‘By players, for players’. Fifteen years later, Unibet is listed on the NASDAQ OMX Nordic Exchange in Stockholm and predominantly owned by European institutional investors. Unibet is licensed by a number of EU Member States, including France, Italy, Belgium, Malta and Denmark. Unibet actively contributed to the establishment of the pan-European CEN WP 58 standard on responsible gambling and consumer protection (CWA 16259/2011), is a founding member of ESSA, the European Sports and Security Organisation, and is audited by independent bodies such as PwC, NMi, eCOGRA, G4 and GLI. After completing articles and qualifying as a Chartered Accountant at PricewaterhouseCoopers, Andrew Beveridge embarked upon a career in merchant banking in London and Hong Kong. Since his appointment in 2003 as CEO of eCOGRA, an internationally accredited testing agency and player protection and standards organisation, Andrew Beveridge has become a renowned authority in fair and responsible gaming and online player protection. He brings nearly 15 years of experience in various areas of online gaming and betting to the position. In May 2010 Andrew Beveridge was appointed Chair of the CEN Workshop Agreement for Responsible Remote Gambling Measures, an initiative involving over 30 participants from trade associations, licensing authorities, operators and experts on gambling behaviour, to develop a set of control measures that will help guide EU regulators and policymakers. Andrew Beveridge also has an MBA from Edinburgh University. Simon Holliday is founder of H2 Gambling Capital, the leading supplier of data and market intelligence regarding the global gambling industry. H2’s data and forecasts have become the industry standard. Simon and his team have collected and analyse data for both land- based and interactive gambling markets, produced forecasts and write material both for the company's publications and on a bespoke basis for clients since 1998. During the past decade Mr. Holliday and the teams he has led have supplied information or worked with nearly 700 organisations operating in, supplying to or analysing the gambling industry. He has worked as a consultant on the due diligence and investor / legislative education process in many of the industry's major financial transactions / regulatory developments during the past decade. 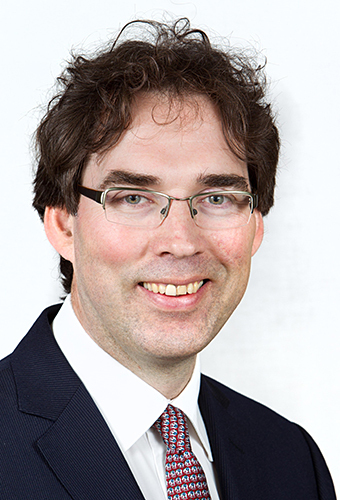 Prof. dr. Patrick Van Eecke is Partner in DLA Piper’s Brussels office and head of the Internet law group. He is a specialist in gambling law, e-commerce, e-government, and data protection issues. Patrick is a professor at the University of Antwerp and is also teaching at King's College and Queen Mary University in London, United Kingdom. Patrick has extensive expertise in advising and assisting national and multinational players in the gambling market and has in-depth knowledge of regulatory developments both in Belgium, EU member states, and on a pan-European level. Next to his focus on gambling legislation, Patrick is further specialized in a wide variety of other aspects of the information society with a particular emphasis on e-commerce, data protection and telecommunications. Philippe Vlaemminck heads the ALTIUS EU Regulatory and Trade Practice. He is widely regarded as a leading player in the current debate on gaming and gambling in the EU, and has been involved in every gambling case before the CJEU and the EFTA court. He also acts as a legal advisor to various EU Member States and operators. He regularly speaks on gaming issues and is a frequent contributor to gaming law periodicals and journals such as Public Gaming International (USA), European Gaming Lawyer (UK), IGaming Business, World Online Gambling. He has been awarded the IMGL President Cup award 2010. He is Member of the International Masters of Gaming Law and Member of the European Association for the Study of Gambling. Simon works at the Electronic Money Association, the European trade body for payment services and electronic money. Originally an industrial engineer, Simon has extensive experience in the area of retail payments, electronic money and bank supervision, having worked both as a banker, bank supervisor and at the Dutch Bankers' Association. Simon Moores is the Managing Director of Zentelligence (Research) Ltd, and a Vice Chairman of the Conservative Technology Forum, A futurist, focusing on disruptive innovation and its social and economic consequences, he is a popular keynote conference speaker and Chair of the annual international eCrime Congress. A Former 'Technology Ambassador' for the British Government and Chairman of The Research Group, Simon has presented at and chaired many national and international forums and conferences. These include Visa’s annual Payment Card Industry (PCI/DSS) Europe 2011 in Amsterdam, The ‘Emirates Forum’ in Dubai, IDG's European information security conference in Milan, NATO's 'Intel Fusion' security conference, CAEK in Prague, IEG13 in Barcelona (see interview) and the UK's Ministry of Justice’s conference in London. 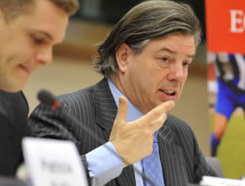 Maarten Haijer is the secretary general of the European Gaming and Betting Association, representing the leading online betting operators in the EU. The EGBA advocates a consistent online betting and gambling market based on fair competition in accordance with EU law. Before joining the EGBA as Director for regulatory affairs, Maarten worked as the internal market and consumer protection counselor at the Netherlands permanent representation to the EU. Prior to that he held several positions in the Dutch administration, dealing mostly with EU and WTO trade policy issues. Jacki Davis is the Managing Director of Meade Davis Communications, an experienced journalist, speaker and moderator of high-level events both in Brussels and in EU national capitals, the editor of many publications, a regular broadcaster on television and radio, and a Senior Adviser to the European Policy Centre think tank. Jacki has been based in Brussels for 18 years, and was previously Communications Director of the European Policy Centre think tank; Editor-in-Chief of E! Sharp magazine; and launch editor of the Brussels-based weekly newspaper European Voice.